Imagine me, relaxing on a big, comfy sofa with my Kindle and a cup of tea. I'm half way through the book and i'm feeling smug. I'm thinking that I know what's going on and where this is heading. I read a lot of these kind of books. I KNOW. Then all of a sudden, Sarah Hilary creeps up behind me and smashes me over the head with a brick. I'm shocked. I have tea all over me. But i'm still having a good time, because the book is brilliant. Once again Sarah Hilary has managed to confound expectations, using a subject matter which has been done before in an innovative and unconventional way. As my teaser review suggests, I was completely fooled by the first half of the book. The author began to weave all the strands of the story and I believed that I knew the end pattern she was creating. Boy, was I wrong. I’m writing this review right after finishing and i’m still punch drunk from the blows. In trying to think of how to describe the second half of the book, all I can say is: ‘I was not expecting that’. As ever, Hilary’s characters are the biggest draw. Even over the suburb plotting. In this instalment, we get a tantalising glimpse of Marnie's stepbrother, Stephen, all grown up and scary as a nightmare. It is no understatement to say that i’m desperate to find out more about this mystery. There is more darkness to come with this story, I can feel it. Many thanks to Sarah Hilary, Headline, and Netgalley for this copy in exchange for an honest review. Sign into Goodreads to see if any of your friends have read Tastes Like Fear. Great teaser, Emma! I'll be adding this to my TBR. Thanks! Avonna wrote: "Great teaser, Emma! I'll be adding this to my TBR. Thanks!" It's worth it, for sure. The second half comes with so many shocks, i'm still reeling! Fantastic, Emma. Another series I've had my eye on for a while and your take on this one defintely confirms I'll be picking up all the books at some point in the future. Mike wrote: "Fantastic, Emma. Another series I've had my eye on for a while and your take on this one defintely confirms I'll be picking up all the books at some point in the future." 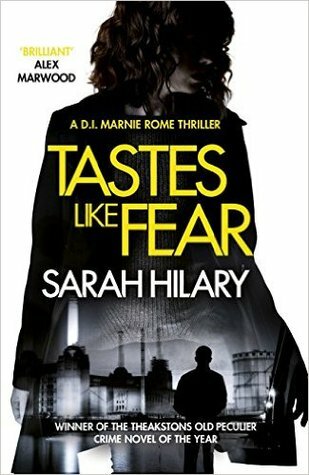 Mike, Sarah Hilary has my highest level of recommendation for crime fiction! Definitely don't miss out. Emma wrote: "Then all of a sudden, Sarah Hilary creeps up behind me and smashes me over the head with a brick. I'm shocked. I have tea all over me. " Lol, sounds like a good one! I'll read it with my bicycle helmet on then! Sandra wrote: "Emma wrote: "Then all of a sudden, Sarah Hilary creeps up behind me and smashes me over the head with a brick. I'm shocked. I have tea all over me. " Lol, sounds like a good one!" Richard wrote: "I'll read it with my bicycle helmet on then!" Good plan Richard. Though Sarah has since apologised to me and admitted that she owes me a cup of tea. All is now forgiven. Terrific review, Emma. I must read this author! Christine wrote: "Terrific review, Emma. I must read this author!" Christine, you absolutely must! Together with Angela Marsons, my favourite crime writers. Fantastic review Emma. Have just requested it - fingers crossed! Maureen wrote: "Fantastic review Emma. Have just requested it - fingers crossed!" I'll cross mine for you too. Emma wrote: "Christine wrote: "Terrific review, Emma. I must read this author!" Christine, you absolutely must! Together with Angela Marsons, my favourite crime writers." Emma, that is a very very large endorsement! Moving first book to "must read" list.